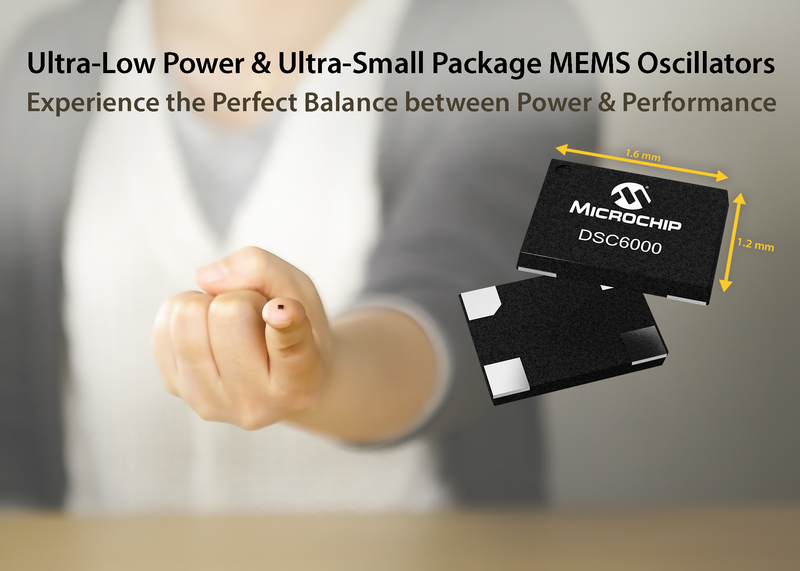 Microchip announces the availability of the DSC6000 family of Micro-Electro-Mechanical Systems (MEMS) oscillators. The new family is the industry’s smallest MEMS MHz oscillator with the lowest power consumption over full frequency range of 2 KHz to 100MHz. The single-output DSC6000 MEMS oscillators are excellent choices for use as clock references in small, battery-powered devices such as wearables and Internet of Things (IoT) devices in which small size, low power consumption, and long-term reliability are paramount. They also meet the stringent mechanical durability and reliability requirements within Automotive Electronics Council standard Q100 (AEC-Q100), so they are also well suited for under-bonnet applications. Microchip’s DSC6000 oscillators are housed in industry standard 4-pin DFN packages ranging from as small as 1.6 x 1.2 mm up to 7 x 5 mm, and consume just 1.3 mA (typical), less than half the current consumption of the lowest-power quartz-based oscillators. They also have a maximum operating temperature range of -40o C to +85o C and +/-25 ppm maximum drift over this range. They can sustain 500 times more shock and five times more vibration than a quartz oscillator, ensuring rock-solid stability in most operating environments. To facilitate evaluation and development, Microchip’s ClockWorks Configurator is available online at clockworks.microchip.com/Timing. Microchip’s TimeFlash Field Programming Kit that supports the DSC6000 family is available at http://www.microchip.com/timeflash, priced between $130 to $350. Evaluation boards programmed to customer specifications are available upon request. 1.6 x 1.2 mm; 2.0 x 1.6 mm; 2.5 x 2.0 mm in 4-pin VLGA; and 3.2 x 2.5 mm in 4-pin VDFN.